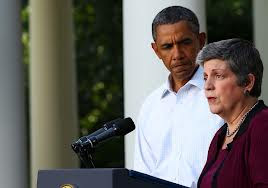 Homeland Security (DHS) Secretary Janet Napolitano does not have the authority to refuse to enforce laws that require illegal immigrants to face deportation, according to the federal judge hearing the Immigration and Customs Enforcement union’s lawsuit against DHS. “The court finds that DHS does not have discretion to refuse to initiate removal proceedings [when the law requires it],” U.S. District Judge Reed O’Connor said today, per Business Week. O’Connor asked DHS and the ICE union to offer additional arguments before he makes a final ruling on the legality of President Obama’s “deferred action on childhood arrivals” (DACA) program, which invoked prosecutorial discretion as a means of allowing people to stay in the country if they would have qualified for amnesty under the DREAM Act, which never passed through Congress. The Judge doesn't know who he's dealing with.